Multitools are fabulously useful, unless you do not have yours handy when you need it. It doesn't matter how many gadgets you cram into an all-in-one, if it is being a really efficient use of space on your nightstand. Frustrating. A wearable multitool you never take off, though, yeah, that sounds promising. 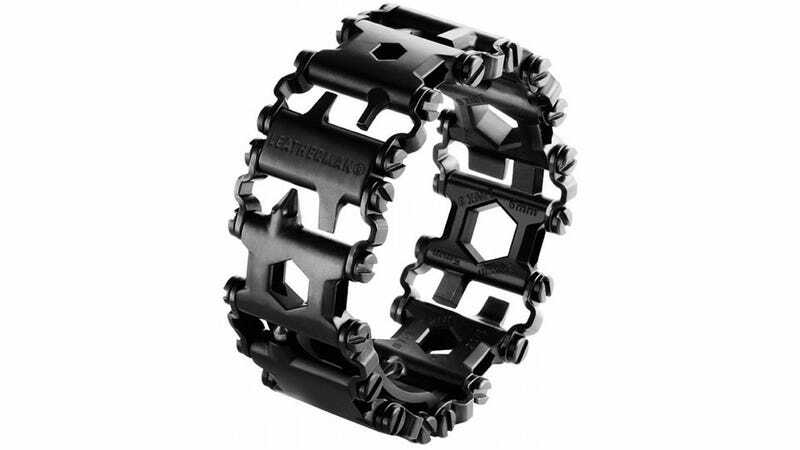 Leatherman's forthcoming Tread looks exactly like a stainless steel watchband. Each of the links has two or three tools built-in for a total of 25 "features." Leatherman doesn't list them all off, but you can see a set of hex wrenches, screwdrivers, a can opener, and a few other pokey shapes that must have some utility, but I can tell for sure what they are. The Tread looks just like a watchband, and eventually it will become one, when Leatherman starts selling it with a swiss-made timepiece in the fall. The basic bracelet is due this summer. No word on how much Leatherman wants for either. I updated this post because it's unlikely that you have to disassemble the bracelet to use it. Thanks to the reader who pointed that out. I'm a dumb.